Level 8 Craftling: Giveaway Winners! I used a random sequence generator to determine the winners of the giveaways, with the first number in the sequence being the winner (counting the first commenter as #1). There were nine people who entered the creeper plushie giveaway! And the winner is Richard Healey, whose son loves Minecraft and will be turning 8 soon. I love hearing about children playing Minecraft - it's such a wonderfully creative game, and I think it is great. Not only does it expand their creativity, but I imagine it teaches them self motivation and things like that, as there isn't anyone out there telling them what to do - it's all internal, and the simple joy of completing something that you decided you wanted to do. I'm so glad a kid is getting it! There were seven entries for the jeans parts! I'm so glad some people saw the potential in these pieces like I did. I try to minimize what I throw away as much as possible, and these pieces are still great useable pieces. I just have so many other projects going on right now that I wanted to clear space out for other things that were more pressing at the moment. Thanks for letting me do that and knowing that the pieces were going to a good home! And the winner is Mike and Jackie! 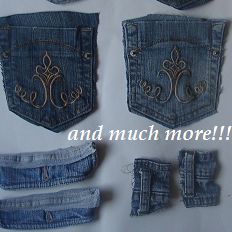 Have fun being creative with the jeans parts!